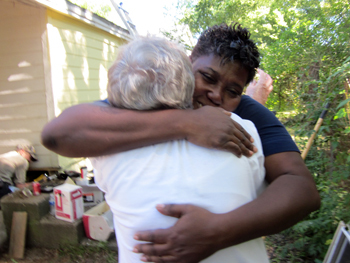 Ruth Craig met Ivy Nunn Saturday morning when she arrived at Nunn’s house to help her paint its exterior a bright shade of yellow. Nunn, a single parent of two, can’t afford to keep up with home repairs, so she applied for help with the Americus-Sumter County Fuller Center for Housing, a Fuller Center covenant partner located in southwest Georgia. Her home became one of nine repair or renovation projects arranged for volunteers to complete during the national Faith in Action weekend, celebrated in Americus Oct. 8-10. “There was a need and we came,” Craig said. Thirty members of Craig’s congregation, Cornerstone Church, took part after their pastor, Derek Vreeland, announced the opportunity to serve as part of this Faith in Action event. Faith in Action is a ministry that encourages Christians to mobilize and “Be the Church,” practicing their faith by serving critical needs within their community. 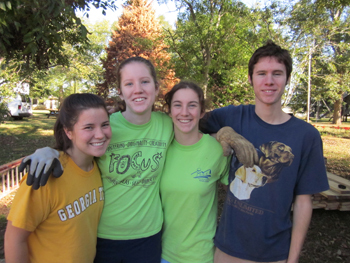 Volunteers totaling 193 and representing 22 local ministries joined the Fuller Center, in collaboration with two other Americus faith-based nonprofit organizations: New Horizons Habitat for Humanity and Koinonia Farm. A volunteer coordinator with the Fuller Center, Fredando Jackson, worked the past three months contacting local churches to help orchestrate the weekend’s activities. “It was powerful witnessing the God movement transform lives, impact communities, and help the church heal the world,” Jackson said, noting deep gratitude to everyone involved. 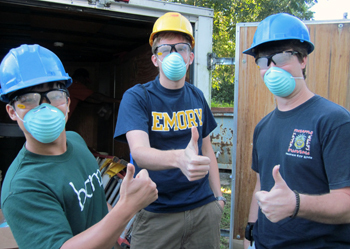 New Horizons Habitat had volunteers from Emory University in Atlanta out to help with a remodel project and a refurbish project. Koinonia Farm worked with some volunteers from Georgia Southwestern University’s Baptist Campus Ministries to repair the rotting roof on its library. Just down the road from Koinonia, in Forest Park Village, Nashua Chantal was the recipient of a Fuller Center repair project. Chantal volunteers with the Fuller Center and Habitat. He lived at Koinonia for many years and still helps out regularly. Now he owns one of the homes from the first Habitat for Humanity (then called Partnership Housing) community built the 1970s. This weekend the Fuller Center helped him with repairs on that home. Mayor Barry Blount participated Sunday morning to demonstrate his support for the weekend of community bettering. By the end of the weekend more than 1,100 volunteer hours were completed, some 200 of which were from Craig’s church. It only took a few of those hours before Craig and Nunn were hugging and making jokes. Find this story in the Americus Times-Recorder newspaper here. Check out the Fuller Center’s Facebook page for more photos and stories from the weekend facebook.com/fullercenter. Get involved with Faith in Action via the Fuller Center’s Faith Builders program.